A Sales Tax Audit? What! Be prepared to answer the door when the IRS comes knocking. Imagine yourself sitting at your desk one day, and your telephone rings, and it is your state tax department calling, informing you that you have been randomly selected for a sales tax audit! “A sales tax audit?” I asked. “We barely sell any products at all.” Well, this happened to us one early spring day in 2013. Now, I am not an accountant, and tax laws vary in all states, but there are things that we learned throughout this process that will be valuable to all practice owners and save you time if this ever happens to you. Keep all receipts and invoices for all purchases made, not just for income tax purposes, but also for potential sales tax audits. Our audit went back three years, but seven years should be a safe timeframe based on the Internal Revenue Service (IRS) recommendations for keeping records. 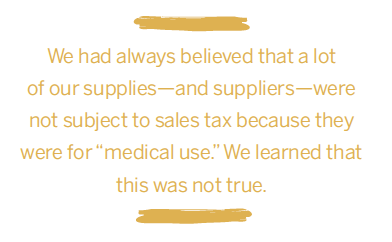 We had always believed that a lot of our supplies—and suppliers—were not subject to sales tax because they were for “medical use.” We learned that this was not true. The tax law in Pennsylvania stated that the only time an item was not taxable was when that item was purchased for the sole use of one and only one patient, purchased for that patient at the time, and only used by that patient. In other words, if you purchase kinesiotape in bulk, and then sell to patients, this is taxable, because you did not order that specifically for that particular patient at the time of purchase. This would also apply to crutches, electrodes, braces, etc. If you purchase an ultrasound machine, that is also taxable because it is not used solely for the use of one particular patient. When a vendor does not charge you sales tax, it is your responsibility to pay that sales tax, to your state, in a return that you file. We have learned which of our vendors were not charging us sales tax, and we now pay the tax for all of the invoices from those vendors on a quarterly basis. Sales tax is also applied to certain services you receive. Our Information Technology (IT) service technician was not charging us sales tax on any of his service calls for computer repairs—as he was also unaware that any of his work was taxable. We now know that certain computer repair work is taxable and certain work is nontaxable. All of our invoices for the last three years had to be revised. Capital equipment was a large part of our audit. We are right next to the state of Delaware, which does not charge sales tax. Regardless, we are responsible for paying sales tax as a Pennsylvania company. Keep this in mind as you purchase large equipment from out-of-state vendors that may not charge you sales tax as a cost savings benefit to you. Be very involved in the process if you are audited. There were many items that our auditor was incorrect on, which we were able to debate and prove we were correct. Your state should have a booklet or guide that will itemize every possible item and whether or not it is taxable. This will help you be prepared in the event of an audit so that you can understand what your tax liabilities truly are. I am sure you are wondering—what was the damage? At first, the auditor estimated that we would owe about $15,000 in back taxes. After we went through the itemized list, debating things that the auditor did not understand how they were used in our business, the final outcome of our tax liability was $4,694.03. Since this was our first audit, we also had to pay the interest and a failure to file fee, but we were able to appeal the major penalty. The total amount that this audit cost us to the state was $6,338.36. Keep in mind, additional costs to the company included some accountant costs, and I lost about a week of work while I sat with this auditor finding files, invoices, and receipts, and reviewed these with her. Be prepared—keep your records, receipts, and invoices. We all hate to pay taxes, but I hope this personal experience at least arms you with some proactive tips to prepare your business for better protection against a sales, use, and occupancy tax audit. Lisa Mackell, PT, MPT, is the founder and owner of Theraplay, Inc., a pediatric therapy company that provides physical, occupational, and speech therapy services. Theraplay currently has seven outpatient centers, as well as contracts providing early intervention and school-based services throughout Pennsylvania and Delaware. Lisa can be reached at lmackell@theraplayinc.com. It can save your practice—and at the very least, your sanity. My first job was at a geriatric hospital. I quickly realized that the physical therapy department had a few professional problems. The first one I noted was the poor caregiving by one particular therapist who had been practicing for about 10 years. Regardless of the patient’s diagnosis, she always had the exact same treatment plan. Patients would sit in a wheelchair “lineup” against the hallway and our physical therapy technician would have them do two sets of 10 military presses with either a one- or two-pound dumbbell. Then after that the physical therapist would put a gait belt on them and have them walk down the hall 10 feet not once but twice, never more, never less. This was the extent of the physical therapy program, every day the same program. When I first came on board I did not really think anything of this, I just figured that was all of the therapy these people needed given their impairments. But it became “like déjà vu all over again” (borrowing a famous Yogi Berra quote) for each patient. Over time I realized that this was neither appropriate nor ethical, and in fact it was fraud. I discussed my concerns with the physical therapy director who told me that it was none of my business since I was not the director. I soon grew tired of watching this pretense; before long I got out of there and moved on to a new job. I was hired by a local hospital that was supposed to be one of the most progressive orthopedic physical therapy programs in the area. I had worked there for about 10 months when one day I was given a challenging new patient. The patient was a 48-year-old female who was referred to me for low back pain and sciatica. The “prescription” called for moist heat, ultrasound, and pelvic traction, the usual standing orders for this particular orthopedic surgeon. The patient gave a history citing a laminectomy six months prior, as well as a recent onset of pain down the right leg, from her thigh to foot. On examination she could forward bend, backward bend, and side bend fully without complaint of any back or leg pain. Both the straight leg raise test and crossed straight leg raising test were negative for reproduction of any kind of back or leg pain. Neurologically she had no weakness in either lower extremity, no sign of sacroiliac joint dysfunction, or pain with lumbar spring testing. In fact there was really nothing that should have warranted a diagnosis of sciatica. I found the referring surgeon and told him about my promising discovery. What I got back was even more astonishing: “When did you get your medical degree?” I was taken aback at first; I told him that I did not have a medical degree but was well trained as a musculoskeletal physical therapist. I was berated with expletives and was told to “back off” (in so many words). My only thought was how could defensiveness play such a strong role in allowing a health care professional to interfere with the clinical decision making for a patient. I did not lose hope, however. I went to my physical therapy director and told my patient’s story, and the response was eerily similar: “He is the doctor, do what he says to do.” So now I felt stuck between a rock and a hard place. I went back to treating her, without success, and unsurprisingly by the sixth visit her leg pain worsened. I knew I had to do something for this patient. I did what made the most sense; I approached the patient’s family physician and told him what I found. He listened and he followed up with her. Later that day I found out she had received an arteriogram followed by emergency surgery for a condition called “Leriche’s” syndrome, a stenosis of the right internal iliac artery (I had to look that up.) Once again, I felt like I was making a difference in this world. Little did I know what was to come! The next day, I was brought into the physical therapy director’s office and blindsided by the guest appearance of the orthopedic surgeon. In short, I was subsequently fired for insubordination of this particular case. How could that happen? I thought that I helped save this patient from a potential life-threatening condition. As a practice owner for the past 35 years and manager of several employees, I still occasionally recall this story. I look at the current trends in interprofessional collaboration and how far we have come, not only in our profession but also within the health care community as a whole. If you are in a situation like the one I was in, do not let it get you down, and more importantly, do not go along with the masses. Trust your instincts, trust your heart, and provide quality care for your patients because they have placed their trust in you. Mike Cibulka, PT, DPT, MHS, FAPTA, OCS, is an associate professor in the physical therapy program at Maryville University in St. Louis, Missouri. Mike also is the founder and owner of Jefferson County Rehabilitation and Sports Clinic. He can be reached at mtcibulka@gmail.com. Metrics for maximizing the lifetime value of every relationship. The fee-for-service (a payment model where services are unbundled and paid for separately) system is dysfunctional. It is designed to pay us for what we do, not what we know. We are financially rewarded for providing more care but not necessarily better care. The keys to success in tomorrow’s pay-for-performance system will be better case management and better communication. There is some good news: Preparing for tomorrow’s incentives now, will make your practice more successful today. Preauthorization: Based on some arbitrary factors (often only the patient’s diagnosis), the payer authorizes a certain number of visits, units, or sometimes, certain allowed procedure codes. Utilization management: These “Mother May I?” programs have been notoriously burdensome. They often require the therapist to fill out a separate form that echoes information that has already been documented in the patient’s medical record. Postpayment review: The payer, or some contractor working for the payer, reviews chart notes after payment has been made. In the event of an unfavorable review, the payer requires repayment, or withholds payments from claims on other patients. In some instances, the contractor making these decisions is paid based on how much money they “recover” for the payer. The Medicare Manual Medical Review is one example. Annual treatment limits: Arbitrary preordained benefit limits on rehabilitation services. The “20 physical therapy visits per calendar year” or “$1,960 in allowed charges for physical therapy and speech language pathology services combined” are meaningless to consumers. How are they supposed to make judgments on whether or not these annual limits are reasonable when making decisions on purchasing health care coverage? Nonsensical Current Procedural Terminology (CPT) codes: It is hard to imagine a system for creating charges to be paid for our services that would be worse than the combination of complex, timed 15-minute procedures and “untimed” codes we use today. The CPT codes used by physical therapists (PTs) and occupational therapists (OTs) are one of the root causes of overutilization. They are misunderstood by therapists, and even by payers—with Medicare being the lone exception. None of these methods for controlling utilization are fair to the consumer: your patients. In my opinion, they also do not work well for the physical therapist or for the payers themselves. The American Physical Therapy Association (APTA) is advocating for a payment per visit model with evaluation visits paid on the basis of complexity with a gradual transition to payment per episode. More commercial payers are requiring systematic outcomes measurement as part of their quality improvement initiatives. Medicare has already kickstarted the transition from fee-for-service to pay-for-performance: The Bundled Payment for Care Improvement (BPCI) Initiative, Comprehensive Care for Joint Replacement (CCJR) model and Telehealth Initiatives from Medicare are all examples. Whatever form these new payment systems take, I believe that this change is a huge opportunity for our profession. Our colleagues who prepare now will be well positioned to take full advantage. And the good news is that you can make changes today to begin adapting to the new payment systems of tomorrow. provide home exercise instruction and other patient education prior to total joint surgeries? use systems that allow patients to reach you quickly, and get specific feedback if they have any problems? use telehealth technology to monitor your patients’ progress remotely? get paid to follow up on your patients routinely to make sure they are continuing their home program? get paid regardless of the setting, including the patient’s home, assisted living facility, skilled nursing facility, or hospital? provide care without preauthorization, utilization management, or arbitrary treatment limits? use qualified extenders, like assistants, athletic trainers, and aids without financial penalty? become the entry point in the health care system for patients when appropriate? Since a single-payer system appears unlikely any time soon, most experts agree that we will continue to have a mix of government and employer-subsidized commercial health plans. Today, our practices still rely primarily on physician referrals. Tomorrow, the lifeblood of our practices will rely on relationships with the ultimate payers: employers and their employees. The market forces and regulatory changes foreshadowing this change are unmistakable: Most states now have some form of direct access, and insurance plans, employers, and consumers will begin to see the inherent waste of unnecessarily requiring referrals. When employers and consumers have a better understanding about how cost effective our services are, especially when we are no longer tethered with arbitrary and unfair insurance requirements, there will be a huge increase in demand for our services. As the importance of the physician referral relationship diminishes, and relationships with consumers and their employers become more important, we can begin reaching out to these groups today. If we do, it will pay huge dividends in the near future. One of our bigger challenges will be preparing for the increased demand for our services. There will be a dramatic shift in how therapists operate effectively in this new environment. There are simply not going to be enough therapists to keep up with demand if we continue treating patients the same way. As the perverse incentives of fee-for-service go away, we will need to become more skillful case managers. We will need to leverage our skills and knowledge to help patients manage their own care more effectively. Using telehealth technology will become an important adjunct to our practices as we shift more responsibility to the patients themselves. We will also need to utilize our administrative staffs, assistants, and aides to help manage caseloads. Not all patients are well served by coming to our clinics two to three times a week. Identifying those patients who need less frequent in-person visits and closely managing that caseload in between less frequent visits will be a huge key to success. As we begin to take responsibility for providing more effective care, and become an entry point in health care, we will need to become much more skillful at proactively managing our patients. We will need to anticipate and prevent injuries, follow up on all of our patients following active treatment to prevent reinjury, and work with our patients to help them take more responsibility for their own care. Today, there are huge variations in clinical practice patterns, and, as a result, physical therapy is perceived by consumers as an ill-defined commodity. As employers become more discerning purchasers of our services, they are going to demand more evidence of our effectiveness and demand less practice variation. 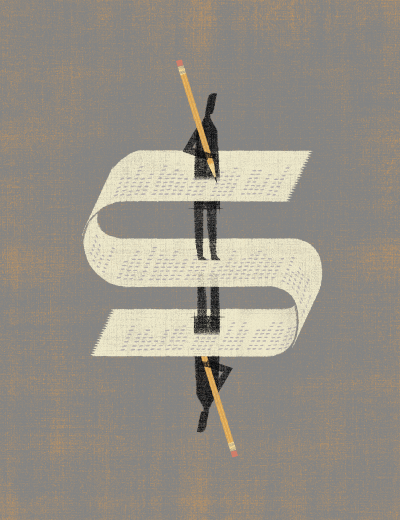 To succeed in a pay-for-performance world, we must offer a reliable, defined treatment system. This treatment system must offer standardized, evidence-based clinical pathways with predictable outcomes. Practices that refuse to participate and standardize around clinical pathways will not be able to participate with many of these employer-sponsored health care plans in the future. We will have to monitor our business by developing metrics based more on clinical effectiveness and efficiency and less on procedure-based productivity. Table 1 is an example of some of the metrics effective practices monitor today and some of the metrics we should begin monitoring as we prepare for the future. There is no doubt that changes are coming. 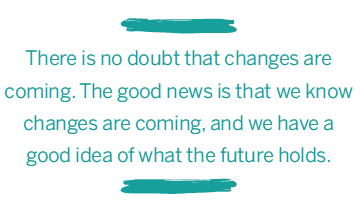 The good news is that we know changes are coming, and we have a good idea of what the future holds. Adapting today will not only prepare you for tomorrow, it will provide immediate tangible benefits to your practice and your patients. 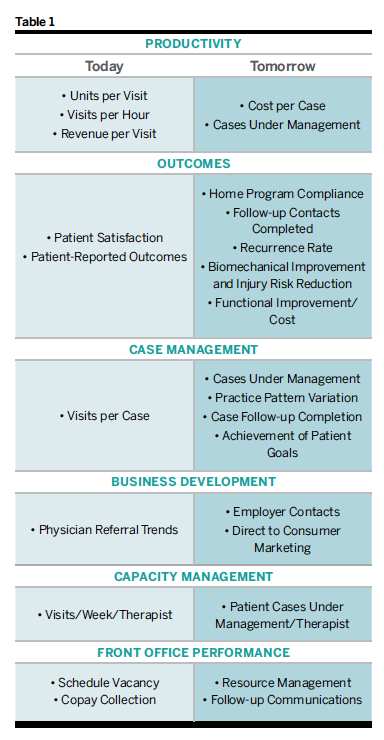 Using proactive case management will improve schedule vacancy and patient satisfaction, as well as that of referring physicians. Standardizing around evidence-based clinical pathways will help you defend your practice against postpayment review utilization management. 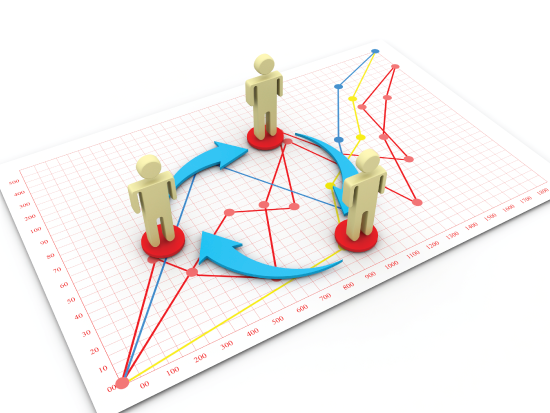 Utilizing outcomes systems effectively will help you monitor and manage quality. As we transition to pay-for-performance systems over the next few years, successful practices will learn how to provide the right amount of care to the right patients at the right time in the right setting by the right providers. Those that prepare now will be very well positioned to enjoy a very bright future. 1. The amount of waste caused by fee-for-service is crippling our health care system and economy. It is not sustainable. 2. https://innovation.cms.gov/initiatives/bundled-payments/. Accessed December 2015. 3. https://innovation.cms.gov/initiatives/cjr. Accessed December 2015. 4. www.cms.gov/Outreach-and-Education/Medicare-Learning-Network-MLN/MLNProducts/downloads/TelehealthSrvcsfctsht.pdf. Accessed December 2015. 6. John Torinus, Jr., The Grassroots Health Care Revolution, BenBella Books, Inc., 2014. Jerry Henderson, PT, is a PPS member and the vice president of Therapist Success at Clinicient. He can be reached at jhenderson@clinicient.com or on twitter @hendersonPDX. Private practice owners know that it is more efficient and cost effective to retain current clients than to constantly look for new potential clients. We spend a great deal of time keeping current with best practices, research, and educational offerings in order to provide effective care for our clients. We seek opportunities to learn best business practices. We network and receive mentoring. Yet we frequently forget a huge part of the equation—providing outstanding customer service to the client from the moment of their first contact with our practice. In order to create a customer for life, we need a plan. The plan is the mapping out of the customer’s experience. We need systems in place to standardize our team approach to creating the customer experience. This is important in a single location practice, and vital in practices with multiple locations. The customer lifecycle is your customer’s experience. It serves as a template for creating your plan for outstanding customer service as it defines each step of the process. The objectives of the lifecycle are to facilitate the arrival of new customers, set the treating provider up for success, retain customers, and create customers for life. The ultimate goal of the customer experience is to build relationships. This requires a team approach to prevent surprises for any member of the team or the customer along the way. Phase one starts at the time of the initial contact with your office and lasts until the customer’s arrival in the office. The objective is to turn a potential customer into a scheduled customer, while collecting the data necessary to begin the course of care. The underlying theme is to be transparent, share the value of your practice, make promises and deliver on them. The key variable in this phase is your frontline team: those who answer the phones and work the front desk. Your frontline team must be trained not only in customer service but also sales. The transparency in this phase lies in sharing the true cost of doing business with your practice in terms that the customer understands. It is always best to provide full disclosure of financial information prior to the client arriving in your clinic for their initial evaluation. At the conclusion of phase one, your frontline team must contact the potential new client with a welcome call just prior to their first visit. If your practice has multiple locations, the call needs to be placed from the office where their initial evaluation will occur. Again, the focus is the professional relationship you are building with the client. Phase two begins when the customer arrives at the clinic and lasts until the completion of their course of care. This is the first step that involves the physical therapist, when the therapist actually begins to interact with the customer. Everything (positive and negative) that has occurred to this point has set the stage for this meeting. The objective throughout this phase is to deliver on your brand promises and provide value to the customer. These steps have been set up by your frontline team. Because of this fact, it is important that all members of the team know and understand what is occurring at each phase of the lifecycle. It is impossible for your physical therapists and assistants to deliver on something that they were not aware was promised. To prevent any misunderstandings in cost at the time of the initial evaluation, your front desk must have complete understanding of what financial information has been shared with the customer. The objective of the evaluation (in addition to the obvious history and exam provided by the therapist) is to secure the customer’s buy-in to their plan of care. The therapist must present the customer with information about their diagnosis and the proposed plan of care to assist the customer in reaching his or her goals. This is when the accountability of the customer is agreed on. This agreement will begin to build trust and will assist in reaching the goal of completion of the plan of care. This is a significant value component of the evaluation! The cycle does not end once the customer has reached their goals and completed their plan of care. Phase three occurs after the completion of care and lasts until reengagement with the customer. Reengagement can be measured by the customer returning for a new course of care or by referring another potential customer to your clinic. Both offer opportunities to continue the relationship and truly create a customer for life. It is important to track these metrics as a measurement of the success of your customer lifecycle. Practice owners often underestimate the need to keep their practice at the top of the customer’s mind. There are multiple options available to practice owners to keep their customers engaged and their clinics front of mind. Monthly newsletters about events are one way to accomplish this objective. Regular educational offerings for the community may be another method. 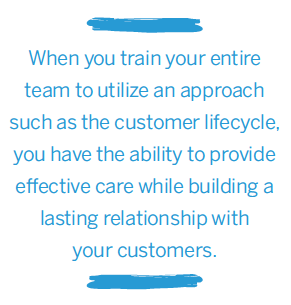 When you train your entire team to utilize an approach such as the customer lifecycle, you have the ability to provide effective care while building a lasting relationship with your customers. Transparency, mutual acceptance of appropriate responsibility, and clear expectations allow clinics to build customers for life. Jerry Durham, PT, is the founder and principal of San Francisco Sports and Spine Physical Therapy in San Francisco, California. He can be reached at jerry@sfsspt.com. Ann Wendel, PT, ATC, CMTPT, is an Impact editorial board member and owner of Prana Physical Therapy, PLLC, in Alexandria, Virginia. She can be reached at pranapt@gmail.com. I started a cash-based physical therapy practice five years ago and was immediately in love with the lack of administrative headaches, paperwork, and rushing from one patient to the next. The patient arrives and spends an hour one-on-one with the therapist, payment is made in full at the end of each session, and the treatment note is usually finished before the patient walks out the door. If patients want to submit self-claims to their insurance, we provide a receipt with the necessary codes and they handle it themselves. Then I received a call from a 68-year-old prospective patient. I knew that if I was not contracted with private insurances, I was not restricted from treating any of their insureds, but what about Medicare patients? Can I treat them on a completely self-pay basis without enrolling in Medicare? This three-article series will give you a synopsis of what I have learned from extensively researching this and related questions, and how this important information applies to all practices, not just cash-based ones. 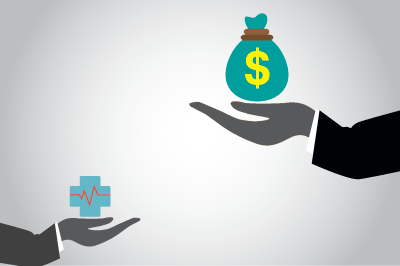 In an age of declining reimbursement for our services, every practice could benefit from increasing its private-pay revenue. We will first examine the overall rules surrounding this topic and then explore the opportunities we can legally pursue with this population. As with many areas of Medicare, there is not a simple and single answer to the question: “Can I provide services to Medicare patients on a private-pay basis?” The short answer is, “It depends.” Now let’s look at all the things it depends on and how they lead to different answers for different types of practices. Participating Providers have signed an agreement with Centers for Medicare and Medicaid Services (CMS) to accept assignment for all Medicare-covered services. “Accepting assignment” means that you have agreed to accept the Medicare-approved amount as full payment for services covered by Medicare. This is the most common and best-understood relationship that physical therapists have with Medicare. You are a “Nonparticipating Provider” with Medicare. You have not enrolled with Medicare in any way, neither as a Participating Provider nor as a Nonparticipating Provider. The term “non-enrolled” is also used to describe this type of provider, while both #1 and #2 above are considered “enrolled” providers. Being a Nonparticipating Provider is not the same thing as “opting out” of Medicare. Similarly, if your practice is like mine and does not participate with Medicare in any way (#3 above), this also is not the same thing as “opting out” of Medicare. Before we continue our discussion of the different relationships with Medicare and how they affect our ability to treat Medicare beneficiaries, we need to understand an important segment of The Social Security Act. In other words, if you provide a Medicare beneficiary with a service that is covered by Medicare, you must submit a claim to Medicare for that service. Most legal and compliance experts say that this mandate applies to all providers regardless of their relationship with Medicare. However, some legal authorities assert that CMS and HHS (US Dept. of Health and Human Services) have no jurisdiction over nonenrolled healthcare providers. They say there is no legal contract between them and no legal precedent exists that proves this mandate also applies to non-enrolled practitioners. I am not making a suggestion of which side is correct. I am simply including all sides of this complicated story so you and your own attorney can make informed decisions if you are not an enrolled Medicare provider. With that said, it would be terribly confusing for the reader if the structure and content of these articles were not based on the acceptance of one side of this issue or the other. Therefore, the remainder of these articles is written on the premise that the mandatory claims submission rule applies to all providers, even nonenrolled ones. This policy may create some opportunities to see Medicare beneficiaries on a cash-pay basis, but these situations are limited based on the specific language used in the policy. This topic is outside of the 1500-word scope of this article, so for now I will continue to explain the rules that apply when beneficiaries have not refused to authorize the submission of bills to Medicare. So now that we have defined the different relationships that physical therapists can have with Medicare and understand the mandatory claims submission rule for covered services, let’s address our original question based on each of those relationships. If Medicare covers the service provided to the beneficiary, you cannot accept self-payment from the beneficiary (beyond the standard deductible and 20 percent coinsurance for the service). You must bill Medicare directly for covered services provided to beneficiaries. You can accept self-payment in full from the beneficiary at the time of service, but you still must send claims to Medicare for any covered services. Medicare will then send any applicable reimbursement directly to the patient. In this situation, you cannot provide covered services to a Medicare beneficiary on a private-pay basis. Due to the mandatory claims submission rule, if you provide a covered service you will have to send a claim for that service to Medicare. However, since you have no relationship with Medicare, you have no way of sending in claims. Therefore, barring instances in which the beneficiary (or their legal representative), of his/her own free will, requests that no claims or protected health information be sent to Medicare, you cannot provide covered services to Medicare beneficiaries if you have not enrolled with Medicare. In my opinion this is totally ridiculous and unfair to both physical therapists and beneficiaries, but at the time of this writing, it is simply how it is. With that said, there are still many situations in which both nonenrolled and enrolled physical therapy practices can work with Medicare beneficiaries on a cash-pay basis. The next step in identifying those cash-based opportunities is to define which services are covered and which are not covered, as well as the scenarios in which covered services may become non-covered. We will dive into these topics next month in Part 2. Jarod Carter, PT, DPT, MTC, is a Private Practice Section (PPS) member and is owner of Carter Physiotherapy in Austin, Texas. He is an author and consultant on the cash-based practice model and can be reached at Jarod@CashPTMedicare.com.